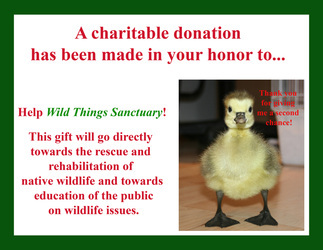 but there are plenty of fun and useful ways to make a gift to benefit their care! By Jennifer Keats Curtis, and photos from various including WTS President, Victoria Campbell. Get a signed copy! 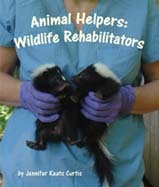 This photographic journal takes readers "behind the scenes" at four different wildlife rehabilitation centers including Wild Things Sanctuary! There is also a "For Creative Minds" educational section in the back of the book. Sylvan Dell: WTS on their blog! Tabitha's Tale is a story of Tabitha, a big brown bat who, along with her friends, loses her home to development. As the bats try to find a new home, they encounter a man that does not understand bats and so evicts them from his home. As he starts to learn the truth about bats, he sets out to bring the bats back to his property. With colorful, eye-catching illustrations, the children in your life will enjoy and cheer for Tabitha and her friends while learning valuable information about bats. Books are $12 and come with a free personalized Bat Buddy sticker with the purchase of every book! 100% of the profits go toward the care of injured and orphaned wildlife. 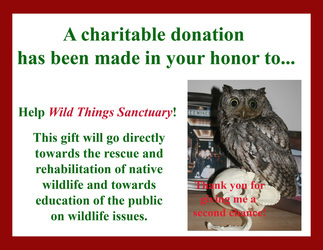 The below donation gifts all come with the displayed cards that can be sent to the gift recipient. 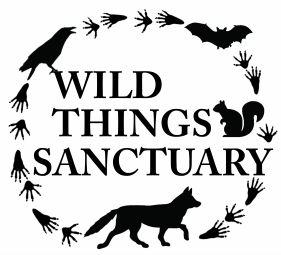 Chose how much you want to give to go towards the mission of Wild Things Sanctuary! Please fill out the form at the end of this webpage if you would like a card to be sent to the gift recipient. Pick the card: a gosling, an owl or a bat family! 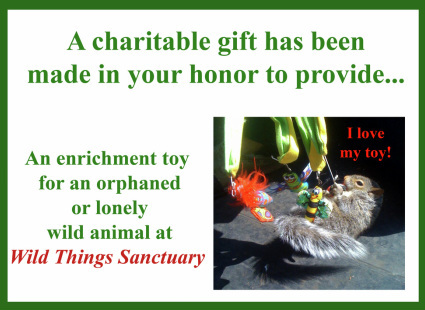 This gift provides an enrichment toy for a patient at Wild Things. Please fill out the form at the end of this webpage if you would like a card to be sent to the gift recipient. 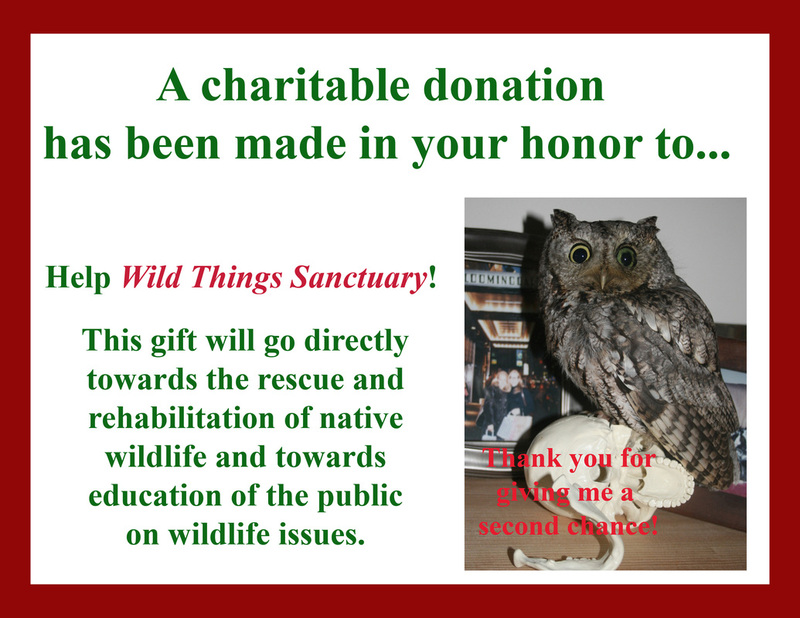 Help a wild thing stay healthy! Provide a rabies vaccination for an animal prone to this deadly virus. 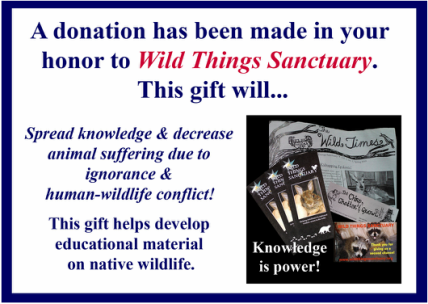 Educate the public, spread knowledge & decrease animal suffering due to ignorance and human-wildlife conflict! 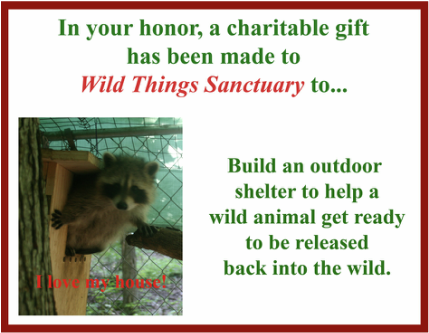 This gift builds an outdoor shelter to help get an animal ready to be released into the wild. 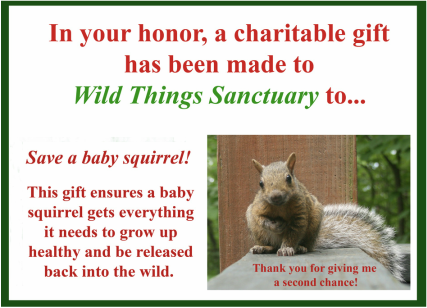 Ensure that a baby squirrel receives everything it needs to grow up healthy and be released into the wild. 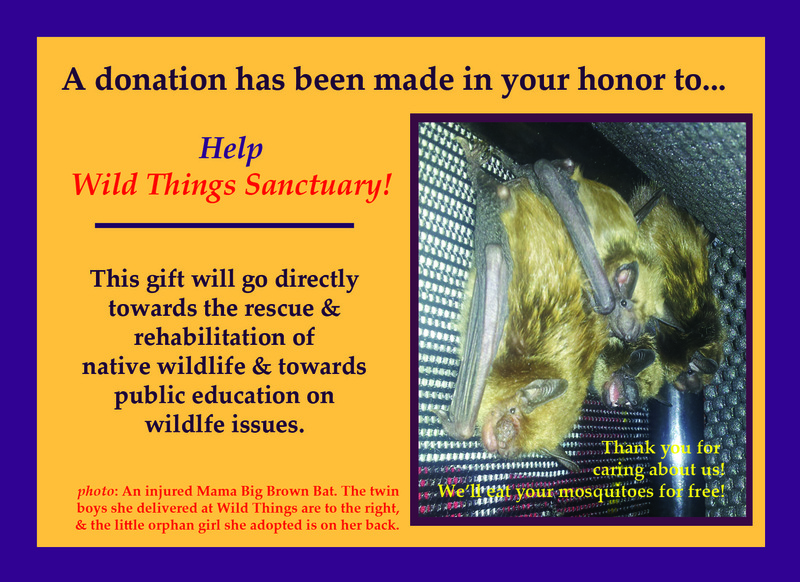 Save a bat! 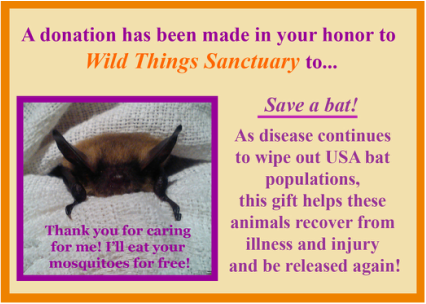 Disease continues to wipe out populations; help them recover from illness & injury & be released! 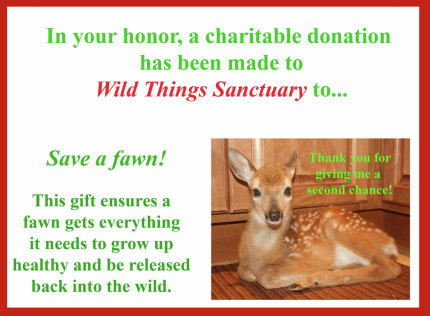 This gift ensures that a fawn receives everything it needs to grow up healthy and be released into the wild. Provide the recipient's email or postal address and the pictured gift cards above will be sent to them. To avoid confusion, please make a note of which donation gift you have chosen in the "comments" section.